I have formulated Kaffir in Cologne strength and this summer will be the test market for it. Enjoy the refreshing uplifting gourmand for only $35 for a half ounce. It is in a spray bottle that can travel easily in your purse or beach bag. Kaffir is an incredibly fun and user-friendly scent, and I have seen everyone from little children as young as three to elderly men in their 80's delight over it. The zesty kaffir lime leaf opening, made even more green and refreshing with galbanum is supported by jasmine and a surprising light musk/woody-leather base. 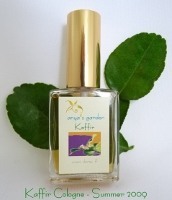 Anya's Garden Kaffir Cologne can be found now at the Anya's Garden website; $35 for 15 ml. Anya McCoy would like to give away one bottle to a Now Smell This reader — be one of the first 15 residents of the US or Canada to comment "I live in the US or Canada" to be eligible for the drawing. Use the "Post a Comment" box — replies to other comments will not count! I've already selected a random number from random.org and I'll identify the winner when 15 people have commented. Update: the bottle is taken, congrats to Hulataina! Please enter me in the draw — I wanted to try this when it first came out. Thanks. See above — I made the instructions in red now. I live in the US or Canada! I live in the US. Thanks! I live in the US! I’d love to try this! I live in the US. This sounds great, I’d love to try it! I live in the US! Pick me, pick me! thanks! I live in the US or Canada! This sounds very lovely; thanks for the drawing. I just realized that I may not be eligible, because I won an NST drawing not too long ago. If that’s the case, I’m sorry for the confusion with my eager post! It’s ok, that rule is only for things NST is giving away. This is being given away by Anya’s Garden. Thanks, Robin. And congrats to the winner! Ding ding ding — we have a winner! Please send your mailing details to robin at nstperfume dot com, thanks. I love that winner’s bell— now I can happily go run errands! Please let me be in the drawing, too! Sounds good for summer! I live in the US, and love reading your blog. Well, I live in the US or Canada as well ! I live in the U.S. or Canada! Hey didn’t Kevin wish that Kaffir came in cologne strength when he reviewed it? His wish came true. OOOOOOH! I am SO envious of the winner. I’ve had my eye on Kaffir for a long time! And that $35 bottle is going to get me to purchase asap. Thanks for the news, at least, even though I missed the drawing! Joe, Anya has just now told me she wants to give away 2 more bottles…we’ll do that tomorrow! That IS good news! Can’t wait for tomorrow! Ooh, me too! This one does sound like a beauty. I live in the US, so if there’s another bottle enter me!